This licensed Dora the Explorer Bounce House Rental allows children to play, laugh, and learn with the sweet Spanish-teaching Dora. This moonwalk has Dora on a new exploration, with her best friend Boots and her trusty magical backpack. Kids can watch out for the stealing fox Swiper, who is never too far away. 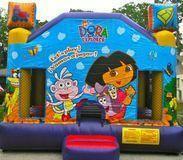 Participants can Bounce and jump through this flower- and butterfly-filled adventure as Dora's says, "Let's Play!". 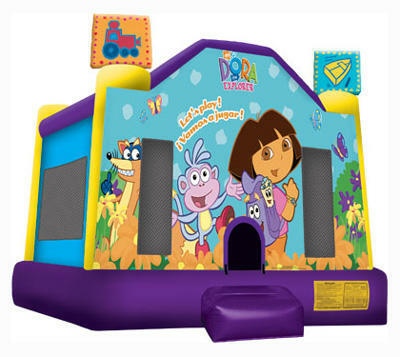 This Moonwalk Rental features a inflatable ramp to enter the Bounce House, once inside there is a large 15x15 Bounce area. 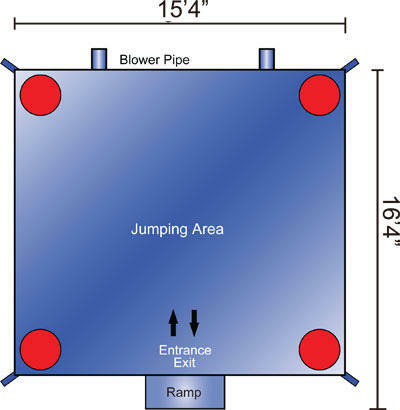 The Bouncer is surrounded on four side by black mesh netting which allows for easy vieing for the adults and allows for a cool breeze to flow through this Moonwalk. Be sure to add shade and seating with our Tent, Table and Chair Packages.